Hope Solo, domestic violence: It is very, very stupid to compare the soccer player to Ray Rice. Or, why it is very, very stupid to compare Hope Solo to Ray Rice. 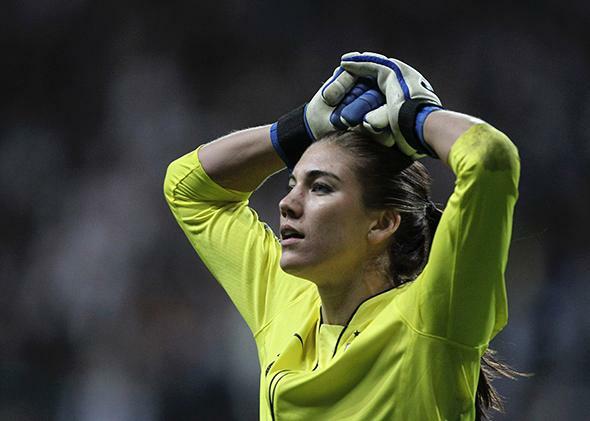 Hope Solo is not Ray Rice, and women’s soccer is not the NFL. The false equivalence here is startling. First, the idea that Solo is getting off easy is based on a standard that was established two weeks ago. Back in July, ESPN’s Jim Caple argued that Solo was, in fact, catching more public heat for her domestic violence arrest than scores of football players who have been arrested for even more serious offenses. The NFL’s new six-game suspension for first-time domestic abusers, as FiveThirtyEight’s Allison McCann wrote last month, quadruples the NFL’s previous average suspension for domestic violence-related violations of the league’s personal conduct policy. It is twice as harsh as the NFL’s previous record for a domestic violence–related suspension. (Tampa Bay Buccaneers running back Michael Pittman was suspended for three games in 2004 after ramming his SUV into a car carrying his wife and their 2-year-old son; the suspension came only after Pittman pled guilty and served jail time.) The NFL’s new normal—where players like the Carolina Panthers’ Greg Hardy and the Minnesota Vikings’ Adrian Peterson are benched with pay pending the outcome of their cases, and Rice has been suspended from the NFL indefinitely—represents a complete inversion of pro football’s prior policy. Again, after years of league inaction and obfuscation, this standard literally emerged in the past two weeks. Even as the NFL begins to treat domestic abuse as a real problem, it’s worth questioning the league’s motivation. Rice was cut from his team and suspended from the NFL in response to overwhelming criticism from fans, domestic violence advocates, and sponsors who were finally fed up with the fact that the NFL has, for decades, taken domestic violence less seriously than it does, for example, drug offenses. Rice’s indefinite ban (which he plans to appeal) is the NFL’s attempt to demonstrate that it takes his crime seriously, sure. But it is also a bid to deflect criticism directed at the Ravens and league officials, who stand accused of purposefully misleading the public about the details of Rice’s crime and their investigation of it. All of the players who have been benched in the past couple of weeks are taking the heat for their league’s long-standing ignorance of domestic violence. It’s not clear that this approach—which penalizes highly visible players while letting the league off the hook—is ideal. What we do know for certain is that it’s not applicable to U.S. women’s soccer, which has no such systematic, decades-long history of ignoring the fact that certain players abuse their partners. The Washington Post’s Cindy Boren asks why “no one is talking about” Solo’s domestic violence case. Congratulations­—we are now, and the level of the conversation is incredibly myopic. Boren suggests that perhaps the silence represents a cultural avoidance of the idea that “domestic violence isn’t simply an issue of men against women.” Well, the perpetrators of domestic violence are overwhelmingly male, the victims are overwhelmingly female, and the violence that occurs between intimate partners represents a far more insidious form of abuse than that of a woman fighting with her extended family. But yes, I agree, advocating for male victims of domestic violence and discussing the role of female perpetrators is a worthy goal. But isn’t it more likely that the lack of public pressure in Solo’s case simply represents the relative lack of attention that women’s soccer receives as compared with pro football? A mixed martial arts fighter who goes by the name War Machine is facing 32 felony charges in the brutal beating of his ex-girlfriend Christy Mack. Based on a Nexis search, that vicious assault has been covered in Macur’s New York Times in just one microscopic AP news brief. Might that be because mixed martial artists are less prominent cultural figures than NFL stars? Macur suggests that holding Solo accountable for a domestic violence charge would be a step toward “a world in which female and male athletes are ever to be treated equally.” She does not explain how benching Solo will actually serve to close the enormous cultural and financial gulfs between men’s and women’s sports, because it won’t. Why exactly do we care about domestic violence in the NFL? It’s not because football players are our nation’s leading batterers of women. (In the Atlantic last week, Conor Friedersdorf nominated police officers for that honor.) It’s because domestic violence is a problem bigger than football, one too easily perpetrated in homes across America and excused by law enforcement, and one that is (again) overwhelmingly committed by male partners who exert physical, social, and financial control to keep their victims in their power. Meanwhile, no institution rivals football in its power to exert social and financial pressure on American men and boys. That makes the NFL an awfully convenient perch for tackling this issue. Domestic violence also serves as a powerful symbol of the toxic masculinity and devaluation of women that football promotes: This is a sport where men are rewarded for beating other men until they can’t even walk or think anymore while women appear solely as sexual objects (a task they perform for a criminal sum) and are systematically underrepresented (to the point of nonexistence) as executives, journalists, coaches, and referees. Now, journalists like Macur and Boren have stripped domestic violence of this context to score gotcha columns about how it’s “inexcusable” to ignore a woman’s alleged criminal acts. But whether or not it’s the right call to suspend Hope Solo, how necessary is it for an institution like U.S. women’s soccer to send a message to young girls that it’s not OK to violently attack their family members? In the long list of social imperatives that can be modeled by women’s sports­—like proving that girls can be strong, active, healthy, competitive, assertive, career-focused, and just as capable as boys on all of these fronts—this one does not exactly compete. Launching a campaign to raise awareness of female domestic abusers would be an absurd way to spend the league’s extremely limited cultural capital. If we’re interested in elevating Solo as the symbolic face of women perpetuating domestic violence, let’s really investigate what exactly she represents. Macur oddly omits the fact that former NFL player Jerramy Stevens—who is no longer in the league after amassing a truly impressive list of sexual assault, battery, and DUI accusations—was arrested for attacking Solo the night before their wedding. The case was dropped for lack of evidence, largely stemming from Solo’s nonparticipation. The couple was married shortly thereafter, kinda sorta exactly like what happened with Ray and Janay Rice. When Macur leaves these parallels out of her story—she doesn’t even mention that Solo is married to a football player, much less that said player is Jerramy Stevens—you have to question what her motivation is in writing this column. Is she legitimately interested in evaluating how the NFL and U.S. soccer treat domestic violence, or does she just want to score some cheap points? “One can argue the differences between an N.F.L. player punching his soon-to-be wife and a soccer star brawling with her family, but it is indisputable that both qualify as domestic violence,” is how Macur compares Rice and Solo. One could also argue about the differences between the NFL and women’s soccer, but it is indisputable that both qualify as sports. So why is one a billion dollar industry that courts millions of viewers, billions in sponsorships, and untold airtime while the other barely registers with the American public outside of the World Cup and the Olympics? And why is no one talking about this? Does any of this mean that Hope Solo should keep playing while she awaits her day in court? Not necessarily. But spare the indignation about how women’s soccer is somehow doing worse on domestic violence than the NFL. If you believe that, you’re either a raging football apologist, or the commissioner of the NFL.